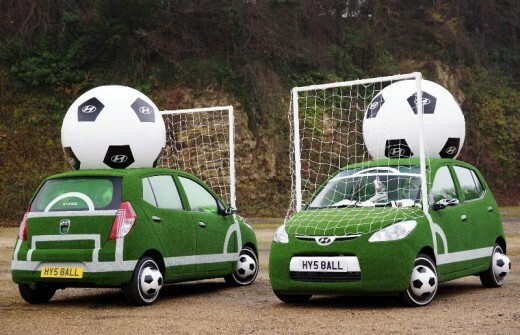 Hyundai is the official car supplier of the 2010 FIFA World Cup in South Africa that begins in shortly. To celebrate the occasion, it made two very distinct i10s in Britain, which win our vote as the wackiest creation by an automaker in 2010. The two i10s are covered in artificial turf. The centre circle on the roof has a 1.5 meter tall football and the car's front-end serves as the shorter side of the field with goal posts. Both the cars look alike, but once you step in, you'll see they differ by miles. One i10 has grass interiors to go with the exterior look, while the other is decorated using football related items. The headrest on this car is a football! Not sure if that'll help retain the occupant protection ratings. The i10 football cars will be used in promotional parades and events across Britain. Some of this will happen in Hyundai showrooms. The cars you're looking at where used during the filming of Jeremy Clarkson's 'Duel' where he and the Stig managed to damage it quite a bit. Car artist Andy Saunders was handed the abused Hyundais and given Saunder's history with Hyundai cars (Andy made an ice-cream van out of an i10 earlier. He also placed a hinge in the middle of the i30 for the London Motor Show), he didn't disappoint.